Scientists, engineers and students at universities across Canada will receive significant support from the Government of Canada to find solutions to key industry challenges over the next decade. By addressing these challenges, these projects will create new jobs, opportunities and improve the quality of life of Canadians. The Honourable Ed Holder, Minister of State (Science and Technology), accompanied by Mike Allen, Member of Parliament for Tobique—Mactaquac, made the announcement at the University of New Brunswick (UNB) today. The university will receive $306,200 over three years to develop new technology to help Canada develop better, cleaner and cheaper renewable fuel and strengthen its leadership in this industry. 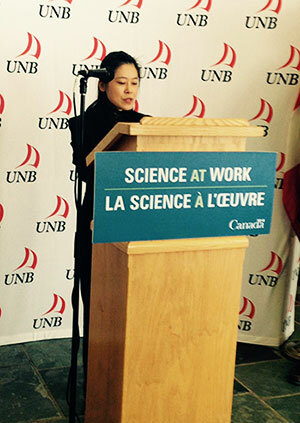 UNB’s Dr. Ying Zheng, Canada Research Chair in Chemical Processes and Catalysis, and her team will work in collaboration with Queen’s University at Belfast and Atlantic Hydrogen Inc. to build on previous catalyst discoveries that improve biofuel quality and yields, and reduce the energy consumption involved in refining them. This research will allow small biorefineries to use this new technology as a cost-effective solution to produce the next generation of biofuels used in diesel and gasoline. These investments are the result of the 2014 Strategic Project Grants competition, administered by the Natural Sciences and Engineering Research Council of Canada (NSERC). Through this program, researchers work with companies on projects that will generate new knowledge and technology with the strong potential to strengthen Canada’s industrial base, generate wealth, and create employment opportunities in areas of importance to Canadians.